As the weather gets warmer, you no doubt want to don your favorite shorts and get out in the sunshine. Unfortunately, shorts season coincides with tick season, and we're in the midst of what one expert calls a "tick explosion." Tick expert Thomas Mather of the University of Rhode Island told Boston 25 News that warm weather is going to lead to a particularly bad summer for ticks. The blood-sucking bugs aren't just annoying—they spread Lyme disease and several other serious illnesses, including a pathogen that can cause a sudden allergy to meat. 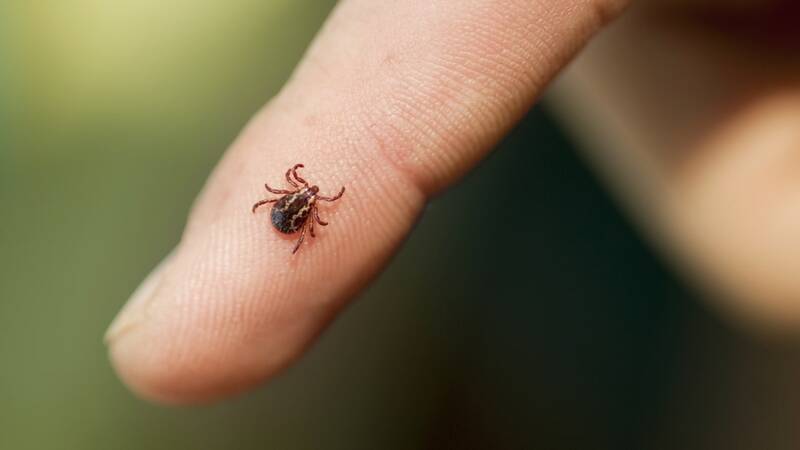 There are several precautions you should take to stay safe from ticks and the risks they carry during the high season, which usually lasts from April to September, though some ticks can stay active year-round as long as it's above freezing. While ticks usually live in grassy or wooded areas, you should be careful even if you live in the city, because pathogen-spreading ticks can still be hiding in urban parks. Tick prevention begins when you get dressed. Wear long sleeves and pants, and if you're in a tick-prone area, tuck your pants into your socks to better protect your legs. Opt for light colored clothing, because it's easier to see bugs against a light color versus a dark one. You'll want to invest in insect repellent, too, for both you and your pets. The CDC recommends treating your clothing (and tents, and any outdoor gear) with permethrin, an insecticide that you can apply to fabric that will last through several washes. Permethrin not only repels ticks, but kills them if they do manage to get onto your clothes, and you can buy socks and other clothing that come pre-treated with it. Insect repellents with DEET are also effective against ticks. Since ticks are most likely to make their way onto your feet and ankles, make sure to treat your shoes and socks. And since your dog is more likely to get a tick than you are, make sure to get Fido a tick collar or some other kind of tick medication. Most of all, you just need to stay vigilant. When you come inside from the outdoors, check your body for any ticks that may have latched on. Ticks can be as small as a poppyseed, so make sure to look closely, or ask someone else to check hard-to-see places like your back. And since they like moist areas, don’t forget to give your armpits and groin a careful look. If you do catch a tick, remove it as soon as you can with a pair of tweezers.